ErtelAlsop offers the widest variety of Laboratory Filters, pilot scale filters, bench scale filter press systems and disposable filter modules for depth filtration. ErtelAlsop’s bench scale filter press laboratory filters provide an optimal means of determining filtration requirements and sizing information at the bench scale. Cylinder Series Lab Filters Gravity, compressed air, or inert gas fed filters. 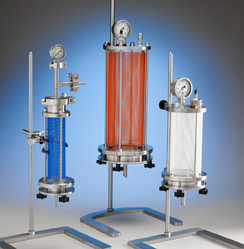 AccuScale Series Lab Filters – 4 and 8 inch plate and frame filter presses. Diamond Series Lab Filters– 4″, 8″ and 12″ plate and frame filters for critical applications. Diamond shape allows for 100% drainage. MicroCaps® Laboratory Capsules – Enclosed, disposable depth filtration capsules. As with all ErtelAlsop Laboratory Filters, filter media is available for any application and/or operating condition. Filter Media is chosen based on your specific operating conditions, the performance required by the filter media and criteria given to us by you and our in house sample processing. ErtelAlsop offers the widest varieties of filter media and construction techniques to provide good particle retention, clear filtrate, high flow rates, and dry filter cakes.